Every summer, SeaDoc brings one or more rising third-year veterinary students to Orcas Island to assist with research projects in conjunction with the Whale Museum in Friday Harbor. The eight-week internship is a great opportunity for vet students to get involved in wildlife health issues. One of their primary roles is to help respond to marine mammal strandings, but they also participate in medical rounds at the Wolf Hollow Wildlife Rehabilitation Center and they work closely with volunteers and spend a good deal of time educating and speaking with the public. This year's interns are Alexa Dickson and Tamsen Polley from the UC Davis School of Veterinary Medicine. 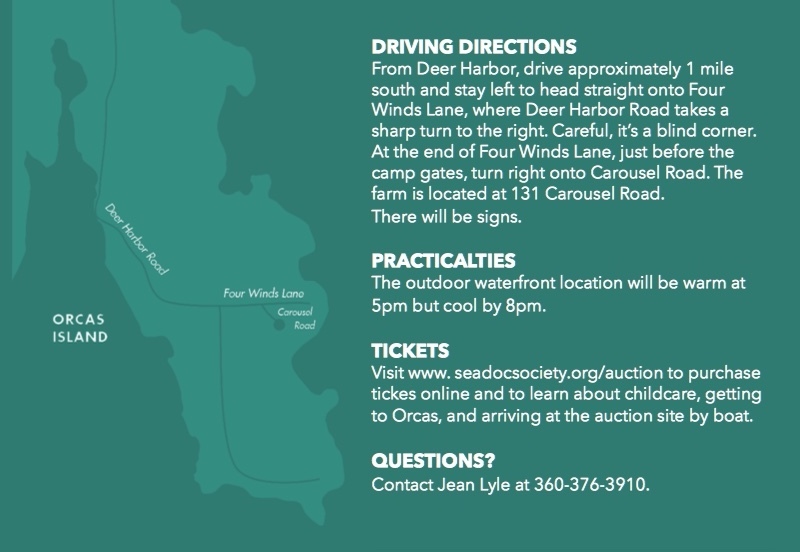 The SeaDoc Society's annual Wine and Sea benefit auction will be held on Saturday, July 14, 2018, starting at 5pm at Family Tides Farm in Deer Harbor on Orcas Island. If you would like to reserve a seat, contact Jean Lyle at 360-376-3910 or jmlyle@ucdavis.edu or purchase online. Please RSVP by June 30. Tickets are $150 per person. This year SeaDoc welcomes a submarine to the Salish Sea and we launch our Junior SeaDoctors program for kids. Join us on July 14 to celebrate an exciting year of science and education. Want to donate wine to this year's auction? Here's how you do it. Predator-prey relationships are strong evolutionary drivers and prime movers and shapers of our natural world. They also make for dramatic stories that seem to portray black-and-white cases of cause and effect. Ecosystems, however, function at such a high level of complexity that seldom are things as straightforward as they appear. In Yellowstone, introduced wolves take down elk and the park’s forests grow and streams revert to meandering courses. In the Salish Sea, seals and sea lions are protected and salmon populations crash. Along the Pacific flyway, we stop poisoning and shooting bald eagles and suddenly seabirds are struggling. Filled with beautiful photography and engaging stories, Explore the Salish Sea: A Nature Guide for Kids inspires children to explore the unique marine ecosystem that encompasses the coastal waters from Seattle’s Puget Sound up to the Strait of Juan de Fuca and the Georgia Strait of British Columbia. Discover the Salish Sea and learn about its vibrant ecosystem in this engaging non-fiction narrative that inspires outdoor exploration. Filled with full-color photography, this book covers wildlife habitats, geodiversity, intertidal and subtidal sea life, and highlights what is unique to this Pacific Northwest ecosystem. The book was written by SeaDoc Science Director Joe Gaydos and board member Audrey Benedict. Pick the wines you want to donate. Be sure to mention this is for the SeaDoc Auction, (you'll get 20% off), and let them know how you'd like to be acknowledged on the bid sheet. We'll take care of the rest! The wines will be delivered directly to SeaDoc in time for the auction. Prices shown below are actual value for the auction. The price to SeaDoc members for the auction are 20% off the prices shown. Thanks to all who have given copies of our new book to the young explorers who will inherit the Salish Sea! Your online contributions to our Indiegogo campaign plus a matching $5,000 donation from Karen and Phil Drayer and several generous donations that came in by mail have pushed us beyond our $20,000 goal! We are so excited to share these books with children who might have otherwise been deprived of a chance to connect with the Salish Sea. If you haven’t had a chance to buy a book for a child in need, visit the book page on our website to see how you can support. We promised a shout-out to all who donated five books or more. Deep thanks from all of us here at Team SeaDoc to all who got behind this campaign! SeaDoc Society Science Director Joe Gaydos reviews Return of the Sea Otter: the story of the animal that evaded extinction on the Pacific coast, by Todd McLeish. Whether you are in the camp that defines sea otters as the epitome of cute or in the other camp with abalone, sea cucumber or urchin fisherman who see them as their nemesis, there is no debating that the sea otter plays a key role in shaping healthy nearshore ocean ecosystems. From Alaska to California, these fascinating and complex animals have survived centuries of harvest and persecution. In at least one location, they’ve even been targeted as prey by killer whales. In his book Return of the Sea Otter, Todd McLeish tells this story. But he also tells the other side of the story; the one of multiple translocation efforts, research and rehabilitation - the story of people committed to making the world a better place, once species at a time. Beautifully written, entertaining and engaging, McLeish’s tale of the sea otter will make you love this incredible animal and the ocean even more, and will leave you with hope that our intensive efforts to better understand and heal our stressed ocean can and will make a difference. Dr. Nina Bednaršek will receive the 2018 Salish Sea Science Prize for her work on the effects of ocean acidification on pteropods. Ocean acidification is a threat to marine ecosystems around the world and the Salish Sea is among those most vulnerable to its effects. Recognition of the problem is new and there are practically no measures in place to regulate or manage it. Enter Dr. Nina Bednaršek, a scientist with the the Southern California Coastal Waters Research Project and winner of this year’s Salish Sea Science Prize. Through years of groundbreaking science, Bednaršek and her collaborators discovered that tiny marine mollusks called pteropods can be used to understand the biological effects of ocean acidification, which is a growing threat due to human-caused pollution. Pteropods are an indicator species for the ecosystem as a whole. The SeaDoc Society, a program of the UC Davis Karen C. Drayer Wildlife Health Center, awards the Salish Sea Science Prize every two years to recognize scientists whose work will result in the improved health of fish and wildlife populations in the Salish Sea. It comes with a $2,000, no-strings attached cash prize and will be awarded to Bednaršek on April 4 at the opening plenary session of the Salish Sea Ecosystem Conference in Seattle. There are currently no established ways to evaluate and regulate the effects of ocean acidification, but Bednaršek’s study of pteropods has laid the foundation for that to change. Her work began in the Scotia Sea off the Southern Ocean, which is an intense upwelling region where deep sea water naturally rises to the surface – a characteristic shared by the west coast of North America, including the Salish Sea where she would go on to study extensively. Throughout her studies in these ocean acidification hotspots, Bednaršek and her collaborators observed the severe dissolution of pteropod shells, which are typically about as thin a human hair. As their shells become damaged, their stress levels rise and they reallocate energy in an attempt to fend off death, leaving them heavily compromised and prone to infection and predation. Pteropods are a crucial food source for many fish in the Salish Sea, including salmon. 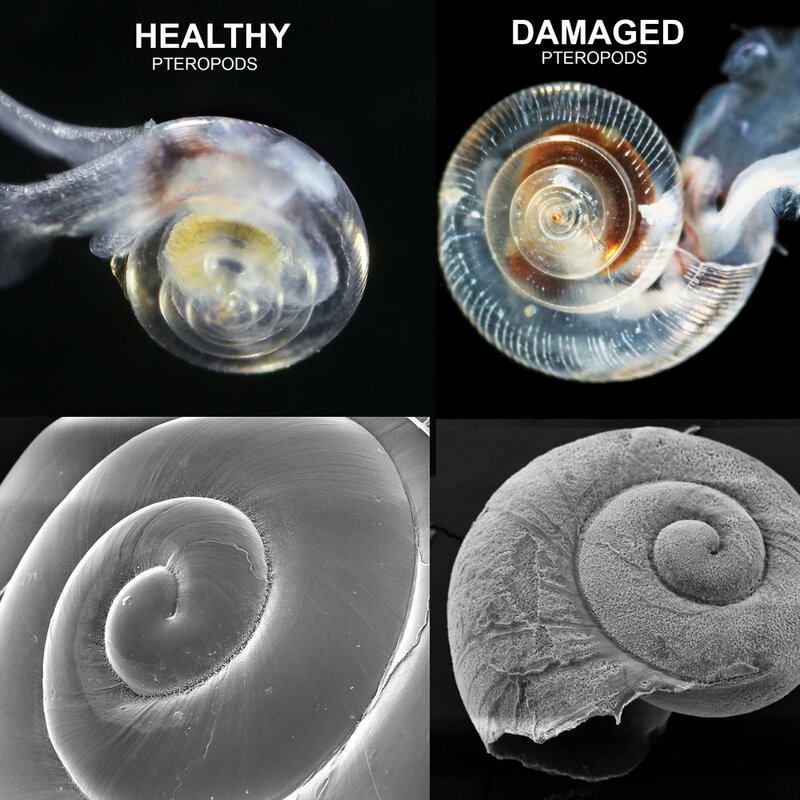 Within a few years, Bednaršek published nine papers describing how pteropod dissolution correlates with physical and chemical stressors in our region, which can be tied to sewage dumping, storm water runoff, carbon emissions and climate change. The highest impacts she has observed throughout her studies have been in the Salish Sea. Bednaršek’s work shows that more than half of the pteropods along the west coast already show evidence for severe shell dissolution, and the individuals affected could be correlated with the local ocean acidification stress. Bednaršek and her collaborators have already developed a set of ocean acidification indices that could be used by coastal States and the U.S. Environmental Protection Agency (EPA) to address water quality issues with respect to ocean acidification, and she has translated that research so that it can be used in water quality management. Dr. Bednaršek's work makes it clear that ocean acidification is already having an effect on biological organisms and is an unprecedented threat on our ocean’s ecosystems. Her work with this tiny creature is filling large gaps needed to drive the kinds of management actions that will be needed to mitigate ocean acidification. "Science plays a critical role in restoring ecosystems like the Salish Sea,” said Joe Gaydos, SeaDoc Society Science Director. "The Salish Sea Science Prize is designed to recognize how science helps us figure out what to do when we are faced with evolving challenges like ocean acidification. We couldn't be more honored to give Dr. Bednaršek this award." A crew with NBC News recently tagged along with a group of fishermen as they ventured into the Pacific Ocean to remove ghost fishing gear -- 640,000 tons of which is lost, abandoned or discarded in the world’s oceans every year. The California Lost Fishing Gear Project was started by the SeaDoc Society’s founding Director, Kirsten Gilardi, who continues to run the project from SeaDoc’s administrative base at the Karen C. Drayer Wildlife Health Center, UC Davis. The work is funded by state and federal grants in California. The SeaDoc Society will soon publish a book for young readers titled Explore the Salish Sea: A Nature Guide for Kids. This week we launched an Indiegogo campaign that allows you to buy a copy of the book for a child who might not otherwise be able to afford it. Our goal is to make the book available to every 5th and 6th grader in the Salish Sea regardless of their ability to pay. (SeaDoc will distribute the purchased books). It’s a great opportunity for SeaDoc supporters to invest in the next generation! Low-income families are disproportionately affected by environmental degradation. We want to make sure every kid has the opportunity to fall in love with the Salish Sea, because its health depends on the next generation. Please consider supporting the Indiegogo campaign today and help us spread the word! Visit the Indiegogo page: www.explorethesalishsea.com. The book, written by SeaDoc Science Director Joe Gaydos and board member Audrey Benedict, is filled with beautiful photos and compelling stories about this unique inland sea. It will be in stores and Amazon on April 17! In the meantime, let’s gift them to the next generation! Learn more on our Indiegogo page. Order at your local bookstore or on Amazon. We want Explore the Salish Sea: A Nature Guide for Kids to be available to every 5th and 6th grader in the Salish Sea regardless of ability to pay. We're piloting that effort by providing the books to students at Camp Orkila on Orcas Island. To buy a book for a student, support SeaDoc on GiveOrcas. The SeaDoc Society has published a book for the next generation. Filled with beautiful photography and engaging stories, Explore the Salish Sea: A Nature Guide for Kids inspires children to explore the unique marine ecosystem that encompasses the coastal waters from Seattle's Puget Sound up to the Strait of Juan de Fuca and the Georgia Strait of British Columbia. Explore the Salish Sea, a new nature guide for kids, is a lavishly illustrated exploration of the waters that connect Washington and British Columbia. The book encourages kids to get out and explore, and to think about ways to help take care of the Salish Sea every day. More than gee-whiz facts, the book is aligned with Washington state core science-learning standards to step kids through the fundamentals of the ecology of the Salish Sea. Explore The Salish Sea is a nature guide for kids. It’s about the unique marine ecosystem that connects Puget Sound with Canada. It’s aimed at fifth and sixth graders and based on a previous edition made for adults. “Joe’s new book is beautiful and, while it was primarily designed for fifth graders, it teaches us all that we can -- and must -- make a difference for the health of the Salish Sea and the living things that depend on it,” said Janine Boire, Executive Director. "He is able to connect the science for people in ways that move us to action." JOSEPH K. GAYDOS is chief scientist for the SeaDoc Society, a marine science and conservation program focused on the Salish Sea. He is a licensed wildlife veterinarian and has a PhD in wildlife health. For over a decade he has been studying the fish and wildlife of the Salish Sea. AUDREY DELELLA BENEDICT is a biologist, writer, and passionate advocate for the conservation of the global ocean and Arctic and alpine environments the world over. She is founder and director of Cloud Ridge Naturalists, a nonprofit natural history educational organization now in its fourth decade. She is currently a member of the board of the SeaDoc Society and served for nearly a decade as a trustee for the Colorado chapter of The Nature Conservancy, from which she received the prestigious One Conservancy Award in 2003 for her work in Ecuador. Audrey splits her time between her home at 9,000 feet along the Colorado Front Range and her off-grid cottage on San Juan's Frost Island. Buy the book at your local bookstore or on Amazon. Amongst breathtaking color photography, The Salish Sea takes a look at the region’s geology, fauna, and history, and ends with hope for the protection of its future. The reader is left with a sense of wonder for this intricate marine ecosystem and the life that it sustains. For the past few years, SeaDoc has led an effort to compile individual health records for killer whales, with an eye toward better understanding threats across entire populations. Great strides have been made on that front, but the power of those records as a tool for research is about to go up a notch thanks to a grant from Microsoft as part of their AI for Earth program. AI for Earth aims to amplify human ingenuity and advance sustainability with the goal of empowering organizations to thrive amid limited resources. SeaDoc will receive a seed grant that provides access to Microsoft Azure’s cloud-computing platform and assistance with artificial intelligence computing tools for data analysis. "It is exciting to have Microsoft investing in recovery of southern resident killer whales but I'm even more fired up about what this is going to do for improving killer whale health," said SeaDoc Chief Scientist Joe Gaydos. Multiple organizations including Center for Whale Research, Fisheries and Oceans Canada, NOAA Fisheries, SeaWorld, SR3 - Sealife Response, Rehabilitation and Research, and marine mammal stranding networks all over the West Coast have been entering killer whale health data into a shared database being built by Lisa Clowers at the National Marine Mammal Foundation. This allows us to look at individual animal health, but the database also permits evaluation of trends, comparisons between populations, and evaluation of factors that contribute to disease, which can be extremely valuable in understanding threats at the population level. Currently the process is slow and definitely not real-time. But this latest grant from Microsoft has the potential to change that for the good of conservation. The grant from Microsoft will permit us to do real-time data entry and evaluation, which will enable us to more quickly and effectively respond to threats. This is particularly important with a species like killer whales, where the added computing power and Microsoft's help in analyzing multiple complex factors will help us understand what causes disease and hopefully help prevent it too. Individual animal immune status, the disease agent itself, and a huge suite of environmental factors influence diseases so we have to address all of those simultaneously to know where we can improve things for the whales. "We believe that artificial intelligence has incredible potential to accelerate efforts to conserve our planet,” said Bonnie Lei, project manager of Microsoft’s AI for Earth program. “We started AI for Earth to get AI tools and training into the hands of people around the world tackling environmental challenges. The SeaDoc Society has long worked to protect the health of marine wildlife and ecosystems in the Pacific Northwest, and we are pleased to award them a grant to use AI tools to better track and protect endangered whale populations." We’re excited about this opportunity to further our killer whale health work, and we thank Microsoft for making these powerful tools available to us. SeaDoc recently received a generous donation to celebrate the induction of renowned photographer and marine environmentalist Ernest “Ernie” H. Brooks II into the International Photography Hall of Fame. The donation was made by Photokunst, a San Juan Islands organization that specializes in marketing fine art photography to galleries. The organization made a special collection of photos available at the Fragile Waters museum exhibition and donated a portion of the proceeds to SeaDoc Society. We thank Photokunst for the generous donation and Salish Sea passion, and we thank Ernie for his incredible work not only documenting marine ecosystems, but actively supporting their health as well. Ernie has won international acclaim for underwater photography. His work has been exhibited in the Metropolitan Museum of Art, Monterey Bay Aquarium Shark Exhibit, Yugoslavia 'Man in the Sea,' Our World Underwater, Smithsonian 'Planet Earth' and was also honored by the Smithsonian Institute. The Brooks II prints, like the one pictured here, are archival pigment on paper photographs hand-signed by Ernie, matted and framed to archival standards. Fellow inductees to the International Photography Hall of Fame include Harry Benson, Edward Curtis, William Eggleston, Anne Geddes, Ryszard Horowitz, James Nachtwey, Cindy Sherman, Kenny Rogers, and Jerry Uelsmann. The IPHF annually inducts notable photography industry visionaries for their artistry, innovation, and significant contributions to the art and science of photography. Where do Pacific sand lance live and why does it matter? Sand lance are a small forage fish known for burrowing into the sand at the bottom of the sea. They’re largely out of human sight, but it would be a mistake to ignore them because they play a crucial role on the bottom of the food web that runs all the way to the top. 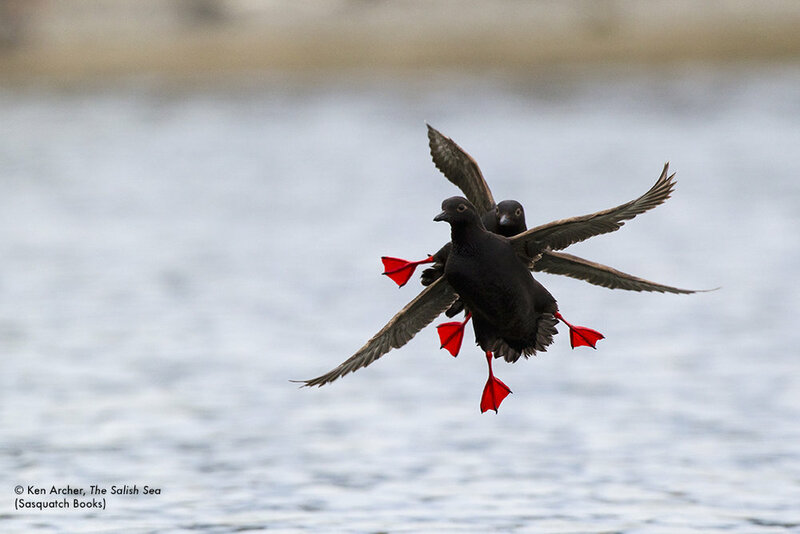 They’re an important food source for sea birds like the marbled murrelet and fish like Chinook salmon. If the Pacific sand lance population struggles, a negative ripple effect could be seen all the way up to southern resident killer whales, which eat Chinook salmon. To date, our knowledge of Pacific sand lance habitat is basic at best, making it very hard to monitor and protect these important fish. That’s why Dr. Cliff Robinson of the Pacific Wildlife Foundation and Dr. Douglas Bertram of Environment & Climate Change Canada pitched a proposal to dig in (read the next few paragraphs and you’ll discover this is a pun!) and enhance the current GIS-based seafloor model that best describes sand lance habitat in the Salish Sea. Defining their habitat and monitoring their population can set the stage for future conservation efforts. SeaDoc is funding their study, which went into full-swing in 2017. The team recently shared some cool photos from their fieldwork. Sand lance are unique in that they bury themselves in medium-coarse sand with low silt content when they’re not feeding in the water column. Robinson and Bertram’s goal is to refine their model to be able to identify and map this important habitat in the Salish Sea. To look for the presence or absence of buried sand lance in potential habitat, the team is taking boats out and using a claw-like grab sampler to pull up sediment or using underwater drop cameras to look for fish entering or emerging from the sand. We’ll keep you updated as they continue their study. 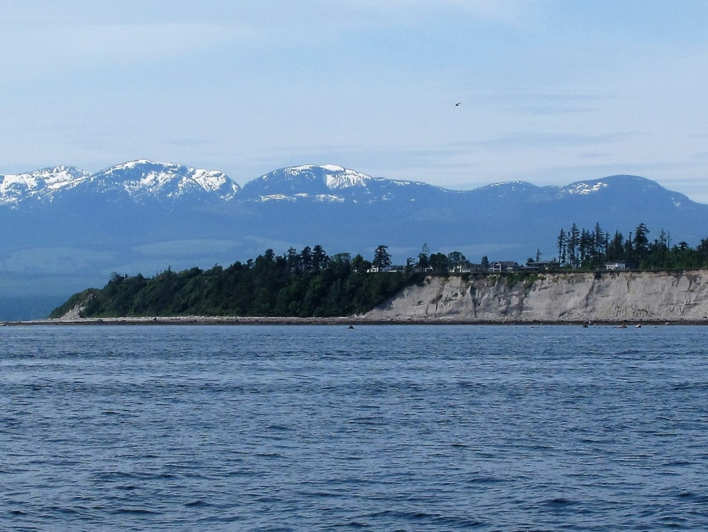 A large sand bluff near Comox, British Columbia with lots of salmon fishers about, which is another good sign for potential suitable sand lance burying habitat. My family and I are extremely excited for this opportunity and we look forward to our arrival on the island come January! A few years ago, while editing the UC Davis Wildlife Health Center’s online magazine, I pitched the idea of a themed volume dedicated to the Salish Sea. I connected with the SeaDoc team and booked a three-day stay on the island, with only a vague idea at the time of the specific stories we would create. Joe Gaydos lent me his pickup truck (Rage Against the Machine queued up in the CD player) and stacked my agenda with boat trips, interviews, lunch meetings and more. I used the gaps in my schedule to film b-roll atop Mt. Constitution, watch Joe’s daughter play in a high school soccer game, edit video in Eastsound cafes and bars, etc. I was amazed by the place (the sea, the town, the mountains, the valleys…all of it) and I shared that with my family upon returning home. In the years that followed, I began working with SeaDoc more routinely, which resulted in more trips to Orcas for the Wine and Sea Auction. I turned the most recent auction into a family road trip so that they could experience it as well. They were equally amazed. All of which is to say, we’re thrilled by this exciting opportunity! SeaDoc is a special program, and I absolutely love working with the team and its dedicated supporters. Aside from that dense reporting trip a while back, I’ve never had time to dedicate myself fully to telling their stories, but in January that will change. There’s so much potential for SeaDoc in the coming years, and I can’t wait to be a part of realizing it. A bit more about me: I have a Bachelor’s degree in communications from California State University, Monterey Bay and a Master’s degree in multimedia storytelling from Northwestern University. I worked in journalism (online and print) prior to joining the UC Davis One Health Institute/Wildlife Health Center four years ago. Outside of work, I write music and play in a band. I snuck in a couple of songs at the Random Howse open mic last time I was on island and look forward to doing it again sometime. I’m moving to Orcas with my wife (Bianca) and two kids (Noah, 5 and Milo, 2). Bianca is a photographer, gardener and lover of libraries. Noah has deep affinity for marine life (especially octopuses and other cephalopods) and Milo is into whatever his big brother is playing with at any given moment. They both have fond memories of their time on Orcas Island. Oh, we also have a cat named Pele. Please come by and say Hi if you find yourself near the SeaDoc office in late January, and reach me anytime at jcox@ucdavis.edu. Over the weekend, The Semiahmoo Yacht Club gathered to celebrate end of year holidays and the SeaDoc Society with a generous donation of $1,000 towards our important work! Located in Blaine, Washington, the yacht club promotes recreational boating, water safety, facilities improvement and good fellowship and sportsmanship with members, friends and the public. This is one great example of how motivated individuals with a shared mission can make a difference in preserving and protecting this extraordinary ecosystem we call home…the Salish Sea. Thanks so much to Commodore Brian Carpenter and the Yacht Club! In partnership with OceanGate Foundation, SeaDoc will bring a submersible to the San Juan Island sub-basin of the Salish Sea in fall 2018 for 5 days of data collection. This platform will be available for scientists to collect data that cannot be gathered by other research methodologies such as scuba or remotely operated vehicle. This year the SeaDoc Society requests proposals only for projects that scientifically address one of the four priority topics below. We anticipate funding one meritorious project in each topic area. Infectious diseases (like viruses, bacteria, parasites, and fungi) and non-infectious diseases (such as those caused by contaminants, trauma, allergens, and biotoxins) have the capacity to affect population health and hinder species and ecosystem recovery. Despite the important role that disease can play in hindering Salish Sea recovery, it is understudied. Human-caused underwater noise can create a wide range of negative effects on a variety of taxa and is a problem in the Salish Sea and worldwide. We seek projects that work to better understand (i) the individual and population-level effects of non-injurious noise on species of concern or (ii) scientifically evaluate solutions to increased underwater noise. Of special concern are diving marine birds, teleost fish and marine invertebrates due to scarcity of data about the effect of noise on these taxa. One health is the concept that human health, wildlife health, and ecosystem health are intimately connected. We are looking for research that addresses health using an interdisciplinary approach that goes beyond pathogens and parasites and includes other contributing factors such as habitat loss, globalization of trade, land-use pressure, ocean acidification, contaminants, and climate change. Salish Sea recovery requires the integration of social and biophysical science to better understand drivers of change and tradeoffs among strategic recovery opportunities. We seek social science projects that help identify and prioritize ecosystem recovery strategies and actions. Banner photo: Cyclops on submerged MSLARS preparing for lift off. Courtesy of OceanGate.